You definitely don't want to spill this stuff on your Thanksgiving dinner. Or anywhere else. The Biggest Clean Energy Policy Development You Haven't Heard Of? The primary purpose of this blog is to talk about developments impacting the clean energy sector. Although it may not be immediately obvious why the following news matters, we believe it does - greatly. New Study Finds "Americans don't know much about fracking"
We've called out Bjorn Lomborg (an "associate professor of statistics" who is "not a climate scientist or economist," but who is well known for his "extensive and extensively documented errors and misrepresentations") a couple times on this blog, including this post by Tigercomm President Mike Casey. 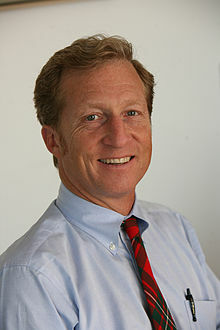 There have been a spate of stories recently in the national media about billionaire investor and clean energy proponent Tom Steyer, who we first highlighted on this blog back in February 2013. At that time, Steyer addressed a 35,000-strong rally against the Keystone XL pipeline and for a clean energy on the National Mall in Washington, DC, arguing passionately that "we can’t afford 40 more years of dirty energy," that "we have to dare to say no to the Keystone pipeline," and that "today we have to decide to invent a cleaner, safer, cheaper energy future together." Solar Industry Magazine has some interesting statistics on clean energy investment, via the Cleantech Group, that we thought were worth passing along. ExxonMobil is one of the most profitable companies in the world, raking in third-quarter 2013 profits of $7.87 billion. That's $85 million per day or $3 million per hour, depending how you want to look at it. So, when we read that ExxonMobil was "hit with [a] proposed $2.6M pipeline fine" - for the Pegasus pipeline spill of around 5,000 barrels of crude oil in Mayflower, Arkansas in March 2013 - we immediately pulled up an Excel spreadsheet to figure out what this meant to the oil company.